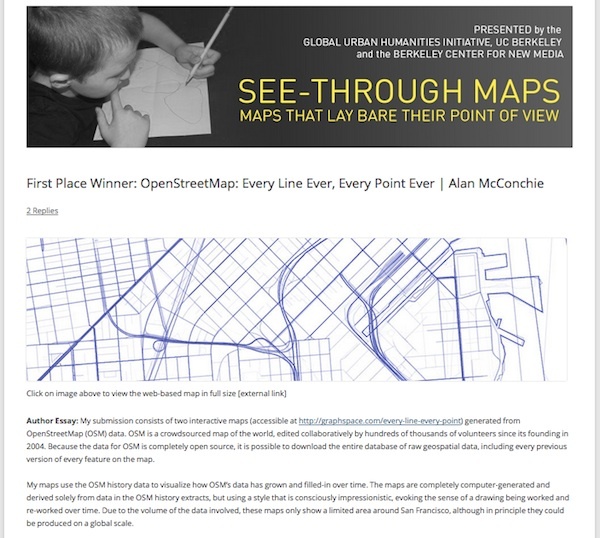 In association with our November 1 Mapping and Its Discontents symposium, the Global Urban Humanities Initiative presented an on-line competition and exhibit of notable maps. Zoomable and interactive versions of these and of a number of other intriguing maps, along with essays by their authors, can be viewed and commented on here. See-Through Maps was co-sponsored by the Berkeley Center for New Media. Mapping and Its Discontents was co-sponsored by the UCLA Urban Humanities Initiative and presented in partnership with the David Brower Center.